New Delhi, Feb 20: Saudi Arabia Crown Prince Mohammed bin Salman received a ceremonial reception at the Rashtrapati Bhavan on Wednesday. In a joint statement, Pakistan and Saudi Arabia on Monday called for avoiding "politicization" of the UN listing regime at a time when India was stepping up efforts to brand the Jaish-e-Mohammed terror group's chief Masood Azhar a global terrorist. 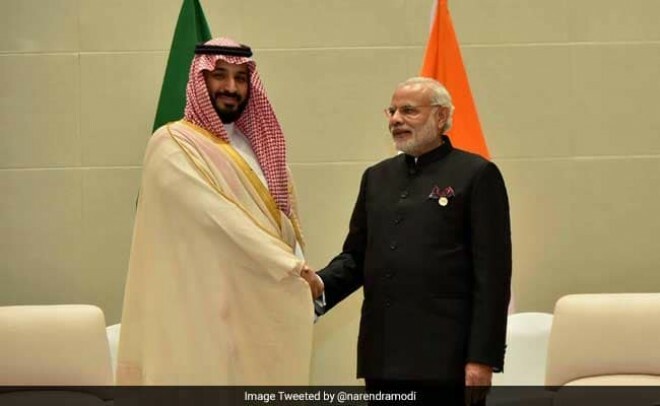 PM Narendra Modi's statement: Saudi Arabia is one of India's most valuable strategic partners. Our relations have grown stronger. I welcome Saudi investment in Indian infrastructure. We welcome Saudi Arabia joining the International Solar Alliance. We also discussed how to further strengthen our defense cooperation. We have agreed that there should be no support for nations backing terror. The Saudi prince in his statement says terror is a common concern. Saudi Arabia and India will share intel on terror, the prince said, but expectedly there was no mention of Pakistan. He said Saudi applauds India's efforts in tackling terror. "Extremism and terrorism are our common concerns. We would like to tell our friend India that we'll cooperate on all fronts, be it intelligence sharing. We'll work with everyone to ensure a brighter future for our upcoming generations," MBS said.